This document is a technical summary of the Federal Highway Administration (FHWA) report, Bond Behavior of Reinforcing Steel in Ultra-High Performance Concrete, available at https://www.fhwa.dot.gov/publications/research/infrastructure/structures/bridge/14090/index.cfm. Ultra-high performance concrete (UHPC) has garnered interest from the highway infrastructure community for its greatly enhanced mechanical and durability properties. The objective of this research is to extensively evaluate the factors that affect bond strength between deformed reinforcing bar and UHPC, and to facilitate the development of design guidelines for using field-cast UHPC in innovative connection details. The results of the research effort and the design recommendations for reinforcing bar embedded in UHPC are provided in this TechBrief. The use of accelerated bridge construction (ABC) techniques continues to grow as owners across the country look for construction solutions that reduce impacts on the users of the infrastructure. In ABC construction, one common technique used is prefabricated bridge elements and systems (PBES). In this practice, bridge elements are prefabricated offsite and then assembled and connected onsite during an expedited construction timeframe. The use of prefabricated bridge elements necessitates the use of field-applied connections between these elements. Field-cast concrete or other cementitious material connections have been deployed for decades by State transportation departments. However, decades of experience has led to the recognition that the field-cast connections often prove to be susceptible to degradation that can lead to substandard performance of the overall bridge system. As opposed to conventional grouted connections, which frequently contain complex reinforcement configurations, UHPC connections often nvolve much simpler reinforcement configurations such as the lap splicing of straight lengths of reinforcement. A few specific connection details, such as those discussed in Behavior of Field-Cast Ultra-High Performance Concrete Bridge Deck Connections Under Cyclic and Static Structural Loading and Development of a Field-Cast Ultra-High Performance Concrete Composite Connection Detail for Precast Concrete Bridge Decks, have been rigorously tested at service and ultimate performance limits. (2,3)The advanced material properties of UHPC provide an opportunity to develop simple and robust connection systems for prefabricated bridge elements. The research discussed in this document focuses on the assessment of bond performance of deformed reinforcing bar in UHPC. This is an ongoing research program at the FHWA Turner-Fairbank Highway Research Center as part of a larger effort focused on developing innovative connection details for prefabricated bridge components. Direct tension pullout tests, with a novel test specimen design and associated loading apparatus, were conducted in this study. The test setup was developed to mimic the tension-tension lap splice configuration that may be encountered in a field-deployed connection system. 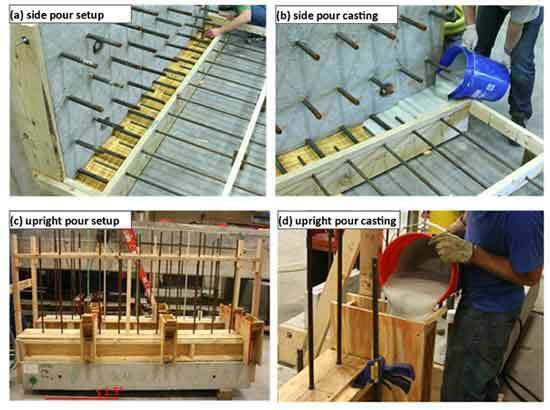 As shown in figure 1, the pullout tests specimens were UHPC strips cast on top of precast concrete slabs. The No. 8 bars extended 8 inches (20.3 cm) from the precast concrete slab. UHPC strips were cast on top of the precast slab with the No. 8 bars in the center of the strips. Each testing bar was situated so as to be embedded into the UHPC strip and located between two of the No. 8 bars. Figure 1. Illustration. Overall configuration of test specimens. The pullout tests were conducted using the fixture showing in figure 2. A hydraulic jack was placed on a steel chair, and the steel chair stands on the precast slab. When a pullout force is applied, the fixture reacts against the precast slab. With such a setup, the reinforcing bars being tested as well as the extended No. 8 bars are both placed in tension. The UHPC surrounding these bars transfers the loads between them. This test setup simulates structural configurations wherein lap spliced reinforcement is loaded in tension. Figure 2. Illustration. Loading setup. The effect of embedment length on bond strength was evaluated. All specimens in this section used A1035 No. 5 bar and had a center-to-center spacing between the testing bar and the nearest No. 8 bar of 4 inches (10 cm). Figure 3 shows the test results of bar stress at bond failure versus the embedment length. The specimens shown in figure 3 were divided into four groups, and in each group, the specimens had the same design except for the varied embedment length. For example, all specimens in group "cso = 2db, 1D" have a side cover of 2db, and the tests were conducted 1 day after casting when the UHPC compressive strength averaged 13.7 ksi (90 MPa); the only variable among the specimens is the embedment length. Similarly, specimens in each of the other groups have the same design except for embedment length, and the way each group is named follows the same rule as in the example, showing the information of the side cover in terms of reinforcing bar diameter and testing age. As shown in figure 3, increasing the embedment length of a reinforcing bar increases the bond strength. The relationship between the bar stress at bond failure and the bonded length is nearly linear, similar to that observed in normal strength concrete (ACI 408 R‑03). (5) The linear relationship between bond force and the bonded length in normal-strength concrete is often explained based on the assumption that all lugs bear against concrete at the ultimate stage and help in resisting the applied axial force, therefore at ultimate ,the bond stress distribution is nearly uniform. However, the bond stress distribution in high-strength concrete, with compressive strength over 13 ksi (90 MPa) and without fiber reinforcement, was found not to be uniform in a study conducted by Azizinamini et al. (6) The same researchers also noted that for high-strength concrete, the increase in bearing capacity is more than the increase in tensile strength, which in turn would prevent crushing of the concrete in the vicinity of each lug to the extent that would otherwise take place in normal-strength concrete. In other words, the high-strength concrete would crack before crushing due to the less than proportional increase in tensile strength compared with bearing capacity. All lugs may not participate in resisting applied axial load before the concrete cracks, and the first few lugs contribute the most. The linear relationship observed in this study implies that the behavior attributed to conventional high-strength concretes by Azizinamini et al. may not be present in UHPC, potentially due to the enhanced pre- and post-cracking tensile response of the UHPC. Figure 3. Chart. Effect of embedment lengh: fs,max versus embedment length ld. Concrete cover and bar spacing play important roles in bond strength. In general, for bond failure involving splitting of the concrete, the nature of the splitting failure depends on whether the concrete cover, cso, is smaller than csi, which is half of the clear spacing to adjacent bar. The demonstration of cso and csi is presented in figure 4. When cso is smaller than csi, the splitting crack occurs through the cover to the free surface, as shown in part (a) of figure 4. When csi is smaller than cso, the splitting crack forms between the reinforcing bars as shown in part (b) of figure 4. However, the results for reinforcing bar embedded in UHPC reveal that when csi is a constant value and smaller than cso, the bond strength still increases as the side cover cso increases, instead of being controlled by csi. The models that used bar spacing and bar cover to predict bond strength in conventional concrete may need to be reevaluated in consideration of the added crack propagation resistance provided by fiber reinforcement in UHPC. The research also found that the specimens with contact lap splices exhibited lower bond strengths than specimens with non-contact lap splices, probably due to the fact that the tight spacing between bars limits the ability of the fiber reinforcement to locally enhance the mechanical resistance of the UHPC. However, when the specimen was situated far away from each adjacent bar, the adjacent bars do not contribute to the bond strength, and the performance becomes a function of the mechanical properties of the UHPC. These specimens exhibited decreased bond strength as compared with specimens with the closer non-contact lap splice configuration. Figure 4. Illustration. Bond splitting cracks. Traditionally, the effect of concrete properties on bond strength is represented by the square root of the compressive strength , which is related to tensile strength of the concrete. An increase in the concrete compressive strength increases the bond strength. The same is true for UHPC that an increase in the UHPC compressive strength increases the bond strength. However, the effect of UHPC properties on bond strength cannot be effectively represented by the compressive strength (f'c) or the square root of its compressive strength . Other UHPC mechanical properties, particularly those relevant to the post-cracking tensile behavior of UHPC, may be more appropriate for evaluating the bond strength of reinforcing bar in UHPC. The effect of reinforcing bar size on bond strength is evaluated using A1035 No. 4, No. 5, and No. 7 bars. As shown in figure 6, the bond strength for No. 4 and No. 5 bars are compared in set 1, and the No. 7 and No. 5 bars are compared in set 2. In each set, all the specimens with different sizes of bar were designed to have the same side cover, bar spacing, and UHPC compressive strength; the embedment length varied. Specimens in each set can be either directly compared among those with the same embedment length or compared as a whole by comparing the bond strength, which included the embedment length in the calculation. The bond strength is calculated by dividing the bond force at failure by the overall contact area using the equation shown in figure 5. Figure 5. Equation. Bond strength calculation. where, fs,max is the bar stress at bond failure, db is the bar diameter, and ld is the embedment length. In addition to the average values of bond strength, figure 6 also shows the maximum and minimum values for the included specimens and the number of tests conducted. As shown in figure 6, No. 4 bars have slightly higher average bond strength than the corresponding No. 5 bars in the first set of comparison, and No. 5 bars have higher average bond strength than the No. 7 bars in the second set of comparison. The tests results indicated that bar diameter does influence bond strength and that smaller bars exhibit comparatively larger resistance. Figure 6. Chart. Bond strength versus bar size. Three types of reinforcing bar are evaluated in this study, specifically A615 uncoated Grade 60 bar, A615 epoxy coated Grade 60 bar, and A1035 uncoated high strength Grade 120 bar. The specimens were grouped into six sets based on different design details, and in each set, all the specimens have the same design except for the bar type. The average bar stress at bond failure for each type of bar in each set is presented in figure 7. As shown, for specimens with ultimate bar stress at bond failure below or close to the yield strength of the uncoated Grade 60 bar (sets 1 and 2), the uncoated Grade 120 and Grade 60 bar had similar bond strength. When the bar stress at bond failure was greater than the yield strength of the uncoated Grade 60 bar, the uncoated Grade 120 bar had higher ultimate bar stress than the corresponding uncoated Grade 60 bar. In all cases, the epoxy-coated bar had lower ultimate bar stress than the corresponding uncoated bar. Figure 7. Chart. Average bar stress at bond failure for different types of reinforcing bar. The UHPC tested in this study contains 2 percent (by volume) steel fibers. Casting technique can influence the dispersion and orientation of the fiber reinforcement. In this study, the UHPC strips were prepared using plywood forms, and two cast orientations were compared, as shown in figure 8. The first orientation involved casting the specimen on its side as shown in parts (a) and (b) of figure 8; the second orientation involved casting the specimen upright as shown in parts (c) and (d) of figure 8, where the slab was placed with a small slope of approximately 1.5 degrees to facilitate the flow of the UHPC. For both orientations, the UHPC was first poured in from one end and allowed to flow until the forms were mostly filled. Thereafter, the UHPC was poured in from the middle locations. The study found that the orientation of the casting did not have an obvious effect on bond behavior, and, for the purpose of easy construction and casting, the upright orientation was used in most of the tests. However, it was noted that the very end specimens that are closest to the casting point (where the large majority of the UHPC is poured into the formwork) consistently displayed slightly lower bond strength than specimens at the other positions. This behavior is probably related to the variation of fiber distribution inside the UHPC. Figure 8. Photo. UHPC strip casting setup and orientation. The bond strength of mild steel reinforcing bars in a commonly available UHPC was evaluated in this study. It was found that the bond behavior of deformed bars in UHPC is different from that in traditional concrete in many aspects. The following conclusions were developed based on the results of the tests completed in the study. Increasing the embedment length of the reinforcing bar increases bond strength. The relationship between the bond strength and the bonded length for bar embedded in UHPC is nearly linear, indicating that UHPC exhibits enhanced performance as compared with traditional high-strength concrete. Bond strength increases as the side cover increases. Non-contact lap splice specimens exhibit higher bond strength than contact lap splice specimens, likely due to the fact that the tight spacing in contact lap splice limits the ability of the fiber reinforcement to locally enhance the mechanical resistance of the UHPC. When the bar clear spacing is so large that the induced diagonal cracks from the pullout force will not intersect with the adjacent bars, the adjacent bar will not help stop the propagation of the diagonal cracks and the bond strength becomes a function of the mechanical properties of the UHPC. Models that used bar spacing and side cover to predict reinforcing bar bond strength in conventional concrete may need to be reevaluated in consideration of the added crack propagation resistance provided by the fiber reinforcement in UHPC. An increase on the compressive strength of the UHPC results in an increased bond strength. The effect of UHPC properties on bond strength cannot be effectively represented by the compressive strength (f'c) or the square root of its compressive strength . Other UHPC mechanical properties, particularly those relevant to the post-cracking tensile behavior of UHPC, may be more appropriate for evaluating the bond strength of reinforcing bar in UHPC. For bars with larger diameter, the bond strength decreases. Bars that yield before bond failure have less ultimate bond strength than similarly configured high-strength bars that do not yield before bond failure. The epoxy-coated bars have lower bond strength than similarly configured uncoated bars. One of the main goals of the research is to develop design recommendations for reinforcing steel embedded in UHPC, thus providing guidance for designers using reinforced UHPC in innovative applications. This study focused on a widely available UHPC product containing 2 percent steel fiber (by volume). Reinforcing bar sizes ranging from No. 4 to No. 8 and bar types including A615 Grade 60 uncoated and epoxy-coated bar and A1035 Grade 120 bar were included in the study. Bar size from No. 4 to No. 8. Minimum embedment length of 8db. Minimum side cover of 3db. Bar clear spacing between 2db and ls. Minimum UHPC compressive strength of 13.5 ksi (93 MPa). For lap splice reinforcement configurations, a minimum lap splice length of 75 percent of the embedment length is suggested, which is the range into which most of the tests in this study fell. Note that db is the bar diameter and ls is the lap splice length. For situations in which the above conditions are met except that the minimum side cover is between 2db and 3db, the minimum embedment length should be increased to 10db. Refinements of the recommended design can be made for specific applications. For example, if a larger side cover is provided, and/or UHPC has gained higher compressive strength, an embedment length reduction may be possible. The supporting information can be found in the associated report, Bond Behavior of Reinforcing Bar in Ultra-High Performance Concrete, available through the National Technical Information Service at www.ntis.gov. FHWA. (2014). "Ultra-High Performance Concrete," Federal Highway Administration Research and Development. Accessed at: https://www.fhwa.dot.gov/research/resources/uhpc/. Graybeal, B. (2010). Behavior of Field-Cast Ultra-High Performance Concrete Bridge Deck Connections Under Cyclic and Static Structural Loading, Report No. HRT-11-022, Federal Highway Administration, McLean, VA.
Graybeal, B. (2012). Development of a Field-Cast Ultra-High Performance Concrete Composite Connection Detail for Precast Concrete Bridge Decks, Report No. HRT-12-042, Federal Highway Administration, McLean, VA.
Russell, H.G., and Graybeal, B. (2013). Ultra-High Performance Concrete: A State-of-the-Art Report for the Bridge Community, Report No. HRT-13-60, Federal Highway Administration, McLean, VA.
ACI Committee 408. (2003). Bond and Development of Straight Reinforcing Bars in Tension (ACI 408R-03), American Concrete Institute, Farmington Hills, MI. Azizinamini, A., Stark, M., Toller, J.J., and Ghosh, S.K. (1993). "Bond Performance of Reinforcing Bars Embedded in High-Strength Concrete," ACI Structural Journal, Vol. 90, No. 5, pp. 554561. Researchers  This document was developed by Ben Graybeal at FHWA's Turner-Fairbank Highway Research Center. Additional information can be obtained by contacting Ben at 202-493-3122 or in the FHWA Office of Infrastructure Research and Development located at 6300 Georgetown Pike, McLean, VA 22101. Distribution  This TechBrief is being distributed according to a standard distribution. Direct distribution is being made to the Divisions and Resource Center. Key Words Ultra-high performance concrete, UHPC, fiber reinforced concrete, bond strength, deformed reinforcing bar, prefabricated bridge elements and systems, PBES. Notice This document is disseminated under the sponsorship of the U.S. Department of Transportation in the interest of information exchange. The U.S. Government assumes no liability for the use of the information contained in this document. The U.S. Government does not endorse products or manufacturers. Trademarks or manufacturers' names appear in this TechBrief only because they are considered essential to the objective of the document. Quality Assurance Statement The Federal Highway Administration provides high-quality information to serve Government, industry, and the public in a manner that promotes public understanding. Standards and policies are used to ensure and maximize the quality, objectivity, utility, and integrity of its information. FHWA periodically reviews quality issues and adjusts its programs and processes to ensure continuous quality improvement.